If I want to talk about backpacking with a baby, it’s probably worth starting with my definition of backpacking. As I am sure you will know, there are extreme examples, from the hikers and trampers in the wilderness, to the party goers in Thailand’s notorious Koh Phangan. For us, backpacking is about a prolonged period away on a budget. The time allows us to get off the beaten track and experience a culture. Having the backpack gives us freedom to move around to a variety of places using different modes of transport and it is independent so we get what we want out of the trip. I feel backpacking with a baby will evolve over the next few years and develop into its own definition. The decision to go backpacking with our baby initially came easily with my usual impulsive personality habit. 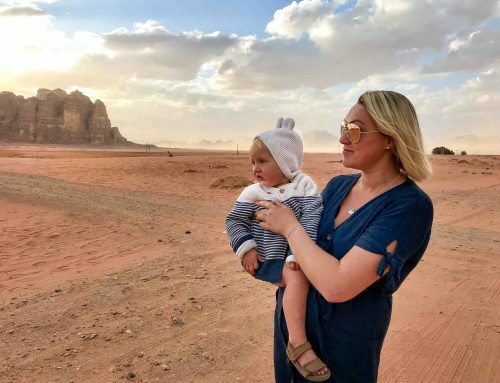 Many concerns such as travel health, feeding what I discovered to be a fussy baby on the go and trying to maintain a routine got me questioning the reality of my initial decision as time progressed. Maybe I was being ridiculous? I would lie if I told you I didn’t put a lot of thought and effort into every element of our trip. My concerns were mainly around putting Esmé at any risk or harm. As you may already know we initially went to New Zealand with Esmé via Singapore when she was ten weeks old. We then backpacked on the way home through Australia, Indonesia, Malaysia, Vietnam, Taiwan, Hong Kong and more recently we went to Thailand and Cambodia. 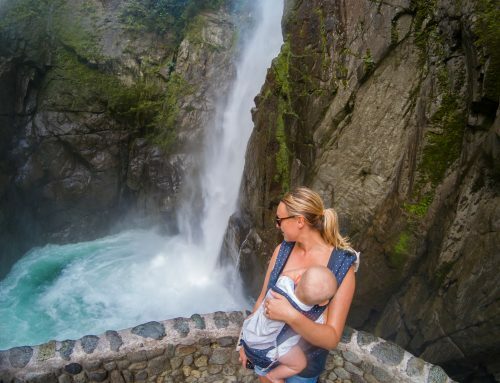 Through the experience of planning and living these trips, I have come up with this information to help anyone that would like to go travelling with a baby. Stare at a map for a while and decide where you want to go. If you are going to visit multiple countries try to hop to neighbouring areas to reduce travel time. This will also help with drastic changes to time zone. While travelling with a baby, it’s more important than ever to understand the health situation in the countries you’ll be visiting. Extensively research travel health and risk for each destination. Fit for Travel is a UK based website that I have seen doctors in the UK and NZ use to advise patients about travel health. It is a great resource for anyone to use where you can look at the malaria maps and avoid high risk areas. Look into other precautions that can be taken. The trip needs to fit around childhood routine vaccinations. Speak to your GP. 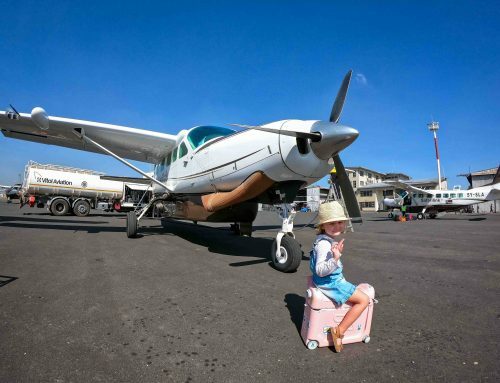 See our article on flying with a baby (our if you child is a little older here is our flying with a toddler post) for more tips on booking flights as well as ways to have a stress free flight. Check flight times and schedules to ensure they are not going to mess up baby’s routine. We generally try to avoid flying during (what would normally be) sleeping times as this tends to cause unrest for baby. On short haul flights this is easier to do than long haul ones. Research the accommodation – we found all of ours on booking.com. I always use the search criteria within our budget per night and overall rating. I looked through reviews for comments about cleanliness and breakfast. You can specifically look at family reviews which is really helpful, and we found reviews from other families travelling with a baby. We have built up ‘genius’ status on the site so we now get discounts and other perks. It makes life a little easier if you don’t have to worry about breakfast and it is generally an easy meal to give to baby; fruits, yoghurts, cereals. Try to ensure it is included in the price of your hotel room. We did some quite challenging things to be able to go backpacking as a family. We rented our house and sold our car when Esmé was ten weeks old. If you think about it, the cost of living is a lot cheaper in Asia than London. By going away, I managed to have my full year of maternity leave. If we stayed in London I would have had to return to work sooner to be able to keep up with mortgage repayments. We had an income from my maternity pay for some of the time and we did a lot of saving whilst I was pregnant to be able to afford the trip. I had two jobs and I worked late into the pregnancy. Whilst we were in New Zealand, I corrected essays on the go for a university and Shaun had some short term work. 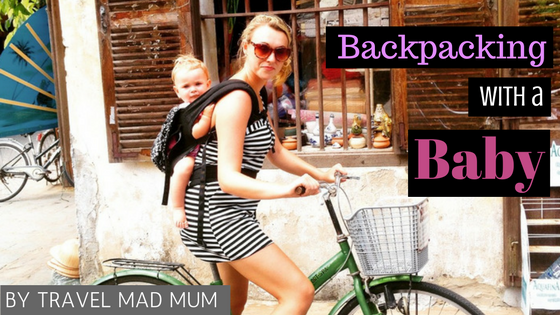 When it came to budgeting to go backpacking with a baby, we allowed for a maximum of £25 GBP per night including breakfast in countries where the cost of living was less. In more expensive countries we upped our budget to no more than £50 per night. As you can imagine we never stayed long in the pricey places. We used budget airlines for short haul flights which really gave us freedom to explore lots of places. We have an air miles credit card which helped us to fund all of our long haul flights. Don’t forget things like travel vaccines for a backpacking family can be expensive; ensure to include these costs in your overall budget. From our experience, we found we spent less whilst away with Esmé in comparison to travelling as a couple. This is probably because you generally have to take things slower and subsequently don’t get as much done, not to mention the lack of exploring nightlife. If you want to know more see financing a baby gap year. Meet with your GP or travel health adviser a good few weeks in advance to discuss vaccinations and precautions required for your destinations. Make up a decent first aid bag and purchase over the counter medicines such as painkillers, anti-histamines, insect repellent, hydration solutions and diarrhea and vomiting preventatives for both baby and adults. 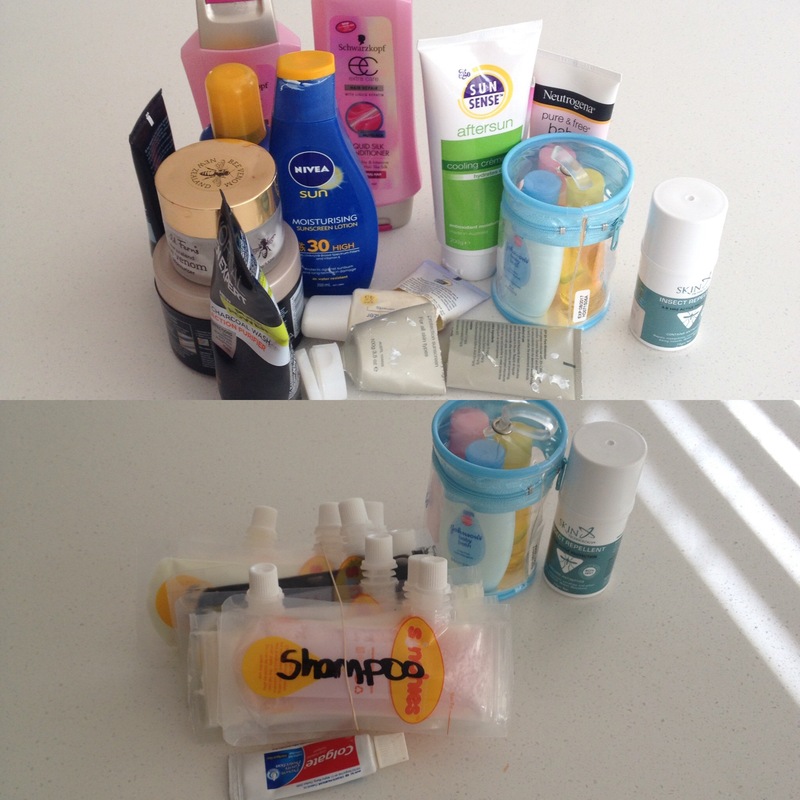 If you want to check out what we put in our first aid bag check out our family travel health post. It might be worth starting baby on probiotics to protect the gut from any nasty bacteria. Look into visa requirements for each country. Even when you can buy them on arrival I suggest trying to get them before hand. I have waited in long and arduous queues with a baby and it’s not fun. I’ve learnt my lesson! If you are intending to rent a car, some places require you to have an international driving permit, make sure to research before hand. If you don’t want to lug a car seat with you, there are lots of companies online you can rent baby travel accessories and they will deliver them to your hotel. Get baby used to the travel cot if you are bringing your own. We brought a pop-up bubble cot . In the weeks leading up to the trip, I put Esmé in it for all of her day time naps. It is a completely different type of cot so I needed her to be used to the mosquito net etc. When backpacking with a baby you are probably going to be ‘on the go’ a lot so it’s worth getting baby used to sleeping in the baby carrier for naps. It has definitely become Esmé’s favourite place to sleep. We use either the Mountain Buggy Juno Carrier or the I Angel Baby Carrier and Hipseat depending on the size of the kids. Choose a really good backpack is important. Its worth reading reviews, like this Osprey backpack review. We used one backpack for our journey between the three of us. We can all make excuses ‘I need this, I need that’ but in reality we hardly wear half of what’s in the suitcase. Would you agree? The same goes for backpacking with a baby and as parents we are more than likely to over do it! Don’t forget, you are going to have to carry it all and your baby. 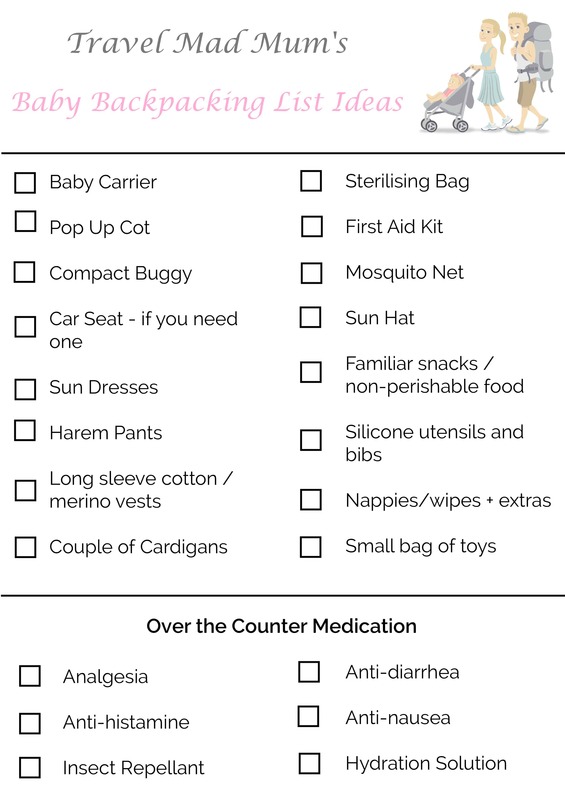 I made a packing list with the essentials for backpacking with a baby, feel free to click on it to make it bigger and even print it off to use later. We have had two trips with Esmé, one where we brought a buggy, car seat and portable cot and the other where we didn’t bring any of the named. We got by and were fine, life was a little easier with not having extra luggage. Its just what makes you feel most comfortable. As you are aware we used one backpack for three of us. Why? You might ask. Well its not fun having to carry so much in terrain that’s not really set up for lugging the kitchen sink with a baby hanging off you! How did we do it? We each had a cloth draw string bag within the backpack. That was each of our allowance and we worked on the basis of 5-6 outfits. It was really hard to make a decision on clothes but we never felt like we didn’t have enough when we were traveling. All of our products were condensed into reusable baby food pouches and labelled. We shared products like baby shampoo for example and I used Shaun’s deodorant. This is actually what saved the most amount of room. I sabotaged my make-up bag and popped eye shadows out of boxes and made little pouches with bubble wrap. I also did not bring my hairdryer or straighteners. It was definitely an ‘au natural’ situation for a few weeks, it wasn’t that bad. During our extensive backpacking trip, I felt guilty I could not offer Esme the opportunity to socialise with other children. Depending on where you are going, there are ways around it. For example, if you are going to New Zealand or Australia, there are rhyme time classes in libraries all over the city that anyone can join in. In Hong Kong, we took Esme to an indoor soft play facility. I also found baby sensory classes in Malaysia. We didn’t actually attend but it might be useful if you are planning to stay a long time in one place. Esmé loves swimming so we always tried to stay near the beach or in a guesthouse that has a swimming pool. She gets so much enjoyment out of it. If you have taken the time out to go backpacking with a baby you are in for some amazing memories and quality time. I can’t explain to you how incredible it was to have Shaun around for most of my maternity year. Esmé and Shaun are so close because they had so much time together in that first year, just the same as mum and baby. Imagine not having cleaning, washing and general household chores to do; instead you have unlimited quality time with your family together. Make sure to cherish every moment and take lots of photos to show your child when they are older. 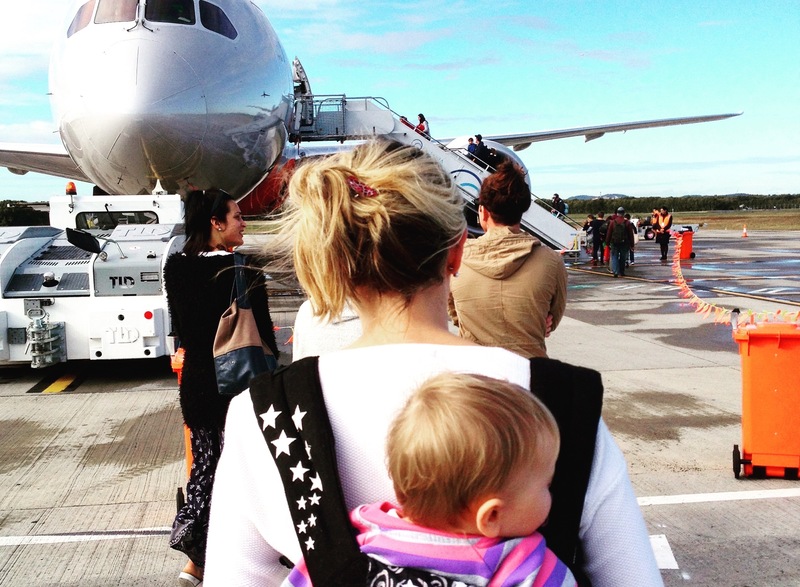 Travelling with a baby is very different, everything needs to be taken much more slowly. Make sure to factor in lots of baby’s favourite activities around all the tourist plans. Esmé very much led our day depending on her mood; if she seemed to be enjoying tourist activities we made the most it. We always tried to continue maintaining a routine where possible with meal times, nap times and bed time. She learned how to sleep ‘on the go’ so we sometimes would have a walk around in the evenings. We just accepted evenings were non-existent and made the most of our days. Sometimes we took turns with activities such as surfing and snorkelling. I think this was important for us to fulfil our adventurous desires. It will be great when we can all do it together, not that I am wishing away these early years that fly by too quickly already! Overall our experience of backpacking with a baby was truly amazing. I wouldn’t change it for the world and I highly recommend it to other travel loving parents. It did help that we were both avid backpackers previously. Have you found this information helpful? We would be so grateful if you could give a small token of appreciation by becoming a patreon which you can check out here. What is a patreon you may ask? In this digital age there is a demand for immediate information online. Being a patreon is a new-age way of giving back for the information, which takes time to put together with no financial return. It’s the very same as Go Fund Me. 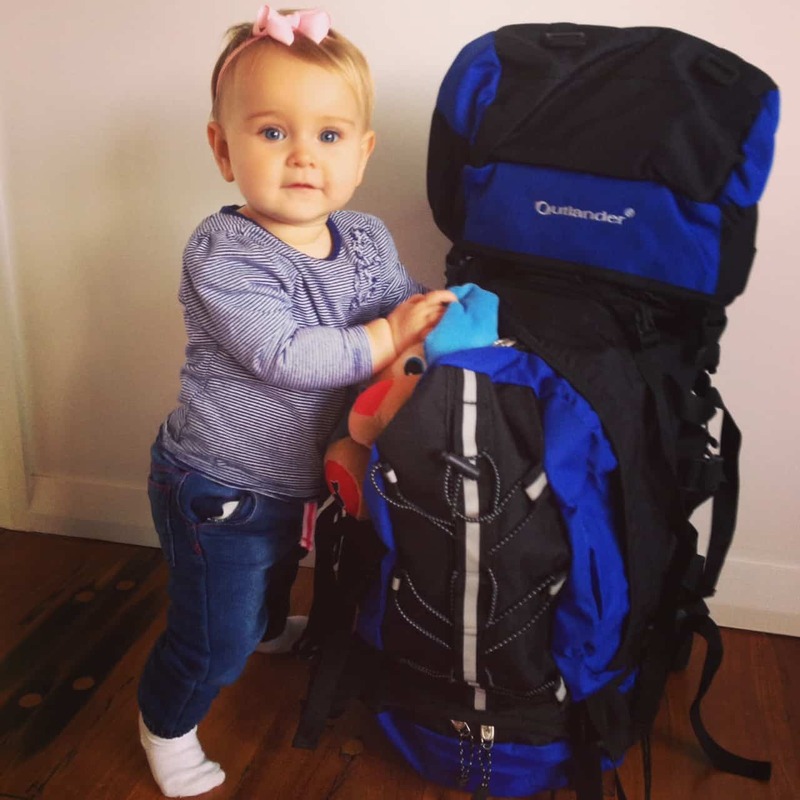 Have you been backpacking with a baby? Share your tips in the comment box below. I love hearing from you! Disclaimer: This post contains affiliate links. If you book using the link, you will not be charged more but we will receive a small referral fee for our travel piggy bank. Thank you for your support! We have to take a baby carrier when we go to hiking or travelling. 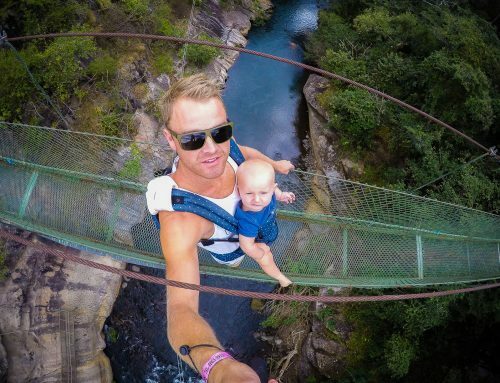 Without a best baby carrier we can’t get pleasure in hiking. Actually I got lot of information from your blog Which you have written your blog. I am sharing this information with friend . We’re currently planning a trip to East Asia with our then 7 month old – for us it was essential that she would get all necessary vaccinations, and e.g. the one against measles is usually only given at 18 months, and in exceptions earlier, but not before they turn 6 months (at least here in Sweden), and ideally you want to wait if there are reactions to it before you leave on a long trip. Thanks for all the useful info in the article. I’m still debating what bring – stroller, crib for the baby? The carrier is a given. Hi Steffi, we are planning on traveling to Thailand next winter when our baby will be 10 moths (she is 1 month now). We are originally from Spain but living in Stockholm and we are new to the health care system for babies here in Sweden. So I wold be very happy to hear any tips from you and your experience, specially about the vaccines. Tack! What do you recommend in terms of bottles, formula, safe water for said formula, etc. for someone who can’t breastfeed? I can’t imagine how it would work with needing up to 12 bottles per day to be made up safely, washed and sterilised. Any knowledge or experience anyone has would be good as I am struggling to think how it would be possible until they are over a year old and can have cow’s milk. My friend used microwavable sterilising bags. If you are travelling to western countries, I can not see why the water would not be safe. It all depends on where you are going. Hi guys. 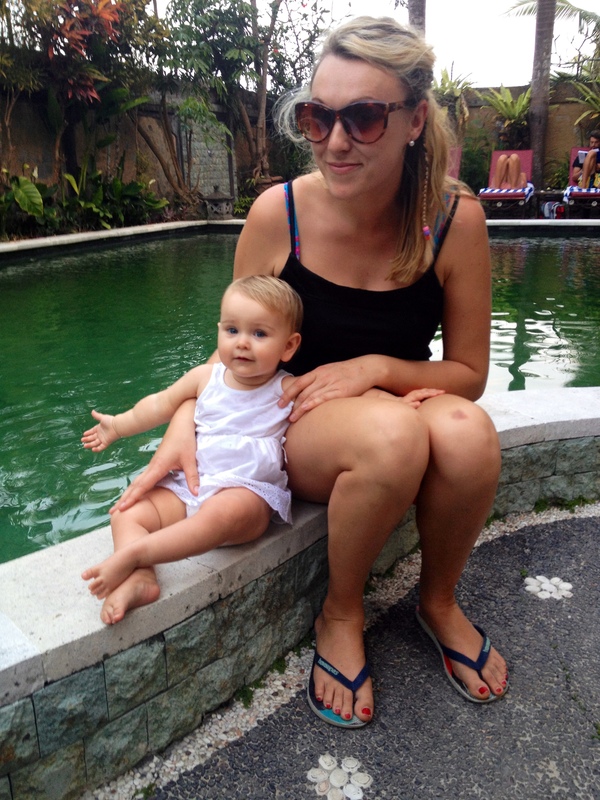 How did you find travelling with a child in Nusa Lembongan. I’m going with my 8 month old in a few weeks. Hey the roads are not very good but not one is moving around very fast, its laid back pace of life. Stay near mushroom Bay, its the nicest area. We loved being there with our daughter who was around that age too when we went. Hi, we were thinking about going to Australia/New Zealand with a 3 month old; how does it work with taxi’s, do you need to bring a car seat (e.g. from airport to hotel)? You can book a taxi with a car seat. You just need to call rather than grab one off the street and the wait time is about 10 minutes. It’s illegal in Australia not to have a seat for a child (under 5 yrs I think) so all the taco companies have them. Just came upon your blog, its wonderful! We are going to be traveling with a 8mo baby. I was just wondering what you did for feeding time. Did you carry some type of dining booster chair with you? Do you think it was useful? Thanks! We have had different ones for both our kids. if your baby is not massive, I recommend the Phil and Teds clip on chair. my son is too big for it, he is a unit but it was perfect for our girl. My biggest worry about having a baby is the loss of my freedom. You have given me a ray of hope! Hello! My husband and I have been full time travelling and volunteering overseas for the last 3 years and living in India. 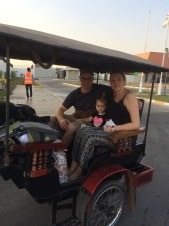 We want to do some travelling with baby (who comes in August) and return to India eventually. My biggest concern is diapers. We would love to do cloth, but it may not be practical with travelling. What do you guys do for diapers? How many do you bring? & do you keep buying as you go? I’ve just finished sleeptraining my baby (with Susan Urban’s How to teach a baby to fall asleep alone book), thinking about having a little vacation soon. I’ve read it’s much easier for the baby to sleep elswere than her own crib if sleeptrained. But I don’t think that we are ready to make a bagpacking trip… Although you inspired me a lot and I’m gonna think about it next time! Hi Karen, thanks for the post, it’s been very useful. In our trip to Thailand we are planning to expend most of the time into the wild and animal sanctuaries. Any tips regarding being with other animal species and into the nature? She will be 10 months when it happens. We mostly stayed in the cities in Bangkok so I don’t have any tips – sorry! We mostly stayed in the cities in Thailand so I don’t have any tips – sorry! We would love to go travelling with our baby but have been put off by the need for immunisations. On Fit to Travel most places state the need for MMR before travelling there – how did you get around this? Our baby has had his 2, 3 and 4 month immunisations but won’t be due his MMR until he is 1 and we’d love to travel before then. I can’t give out medical advise unfortunately – you’ll have to check with your doc. Travellin is a source of pleasure and enjoyment. But I think to travel with babies is a bit difficult. Through the information that you discuss in the article, I get a proper guide that how to manage when we travel with the babies. Thanks for sharing this information. Camping with your baby can be a lot of fun, and can be a special time between you and your baby. 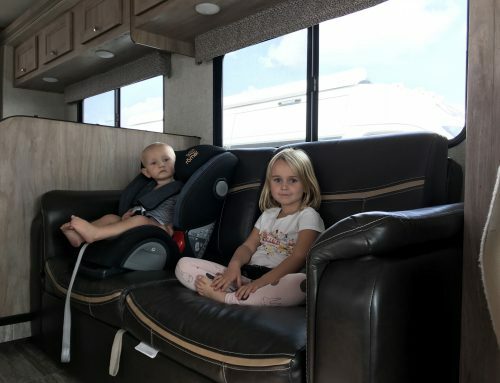 Babies adjust easily and seem to enjoy the new sights and sounds of camping. There are many items made for a baby and for use with a baby on a camping trip. Thanks for the amazing information. Travel is a wonderful hobby for many people all over the world. Through this, we can bring a positive change in life and thinking and health. The travel with the baby is a great source of enjoyment. Actually, I got a lot of information from your blog Which you have written your blog. I am sharing this information with a friend.